As my readers know well, I have repeatedly broached the Marcus Smart-as-starter argument. The 124-107 win over the Pelicans last night was only one game, but it was a delight. Marcus started the game - played a team-high 39 minutes - and was absolutely instrumental in the victory. My argument was always that Smart ignites his team right out of the gate. He is not a scorer and may never be. Doesn't matter! The other starters, Kyrie Irving, Al Horford, Jayson Tatum and Marcus Morris all scored 19 or more points. Marcus notched eight points on 3-of-8 from the field and 2-of-5 on treys. He handed out five assists with only one turnover and played stellar defense. Will this starting lineup continue? I doubt it, but Smart needs to be in the game from the beginning. He takes a lot of pressure off Kyrie as a facilitator, and his disruption of the opponent's offense may be the best in the League. And I am still a believer in Gordon Hayward being in the starting-5. With two facilitators on the floor, Gordon's scoring opportunities may open up. 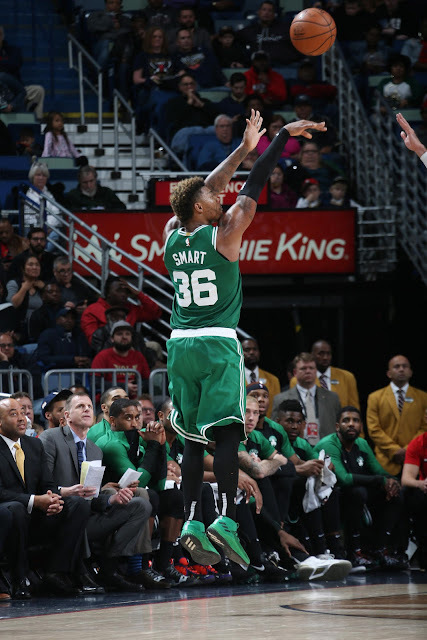 Irving and Smart seem to make for a synergistic back-court, and I would like to see more of the Hayward-Smart interaction. This will play out soon. Marcus Smart: "That’s how we’re used to playing. That’s the team we know. … [that’s] the way we played in the past and that’s the type of game where we have to get back to, where guys feel us from the start."